February may be the shortest month of the year, but it hosts a disproportionate number of holidays. We commemorate the birthdays of quite a few historical figures, from Charles Dickens on February 7 to Handel on February 23, not to mention Gypsy Rose Lee on February 9 and Susan B. Anthony on February 15. And as a food writer I always love the nutty food holidays to be found in this month. These include National Indian Pudding Day on February 17, Cream-Cheese Brownie Day on February 10, National Tortilla Chip Day on February 24, and Surf & Turf Day on February 29. Clearly, despite the chill in the air there is much to celebrate this month. In today’s post, looking forward to Valentine’s Day, I offer an amazingly simple chocolate-cake recipe sent in by Mattenylou, the blogger responsible for the charming On Larch Lane. This “Wacky Cake” dates back to the early 20th century. It’s considered wacky because it includes a little vinegar and because all of the ingredients get dumped together in one bowl and mixed simply with a wooden spoon. Reference librarian Lynne Olver, who runs the wonderful Food Timeline web site, suggests that Wacky Cake (a close relative of Dump Cake and Crazy Cake) first saw the light of day in its present form in the 1940s. Olver adds that similar cakes first appeared during World War I, when (as in the Depression and during World War II) fresh ingredients were scarce. Mattenylou originally sent the recipe to my nephew Michael to make for my birthday in December. She told him that she used to bake it every year for her mother, whose birthday was December 23 like mine, using Christmas-tree shaped pans. Things got a little frantic this past December, as they so often do at that time of year, so Michael and I decided to save the recipe for February. 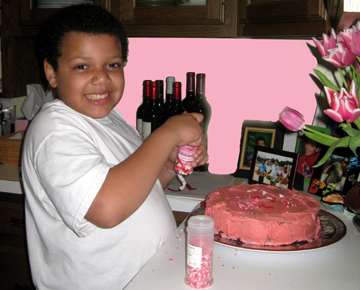 We tossed a little pink icing on top and threw a bunch of red and pink sprinkles on the cake (Michael is a whiz with sprinkles! 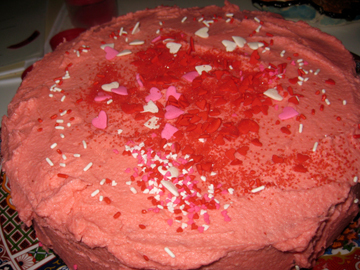 )–and a Valentine cake was born. Mattenylou points out that her recipe can be halved to put in a 9-by-9-inch pan (or a round single-layer pan). She adds that if one mixes up the dry ingredients and stores them in a bag one has a quick, easy cake mix to use when needed. My family loved the cake, which was terrifically moist and rose beautifully. We certainly couldn’t taste the vinegar! Preheat the oven to 350 degrees. Grease and flour 2 9-inch cake pans. In a bowl combine the flour, sugar, cocoa, salt, and baking soda. Make three wells in the combined dry ingredients. Pour the vanilla into one, the vinegar into the second, and the oil into the third. Pour the water over everything and stir with a wooden spoon until the dry ingredients are wet and everything is thoroughly combined. Pour the batter into the prepared cake pans. Bake the layers until a toothpick inserted into the center comes out clean (about 30 to 35 minutes). Frost as desired and decorate with festive sprinkles. Serves 12 to 16. Here is the recipe for the fluffy frosting Mattenylou puts on her Crazy Cake. We liked it but would probably use a standard buttercream or cream-cheese frosting another time; this one takes a LONG time to mix! Cook the milk and flour until the milk bubbles and is thick and smooth, stirring constantly with wooden spoon or whisk. Set the mixture aside and let it cool. Beat the shortening, butter, sugar, and vanilla until they are blended. Add the cooled milk/flour mixture and beat well, for 10 minutes. Add a few drops of green (for Christmas) or red (for Valentine’s Day) food coloring and beat until fluffy. This may take up to 15 minutes, depending on your mixer. The frosting should be fluffy and hold peaks. Don’t forget: You have until Friday night to enter the drawing for a tin of gourmet hamentaschen from Kosher.com. Just leave a comment on this post (or post a tweet on Twitter) that mentions YOUR favorite food holiday and provides a link to the Kosher.com web site. This entry was posted on Wednesday, February 10th, 2010 at 4:00 am	and is filed under Cakes, Pies, and Pastry, Cooking with Kids, Holiday Foods. You can follow any responses to this entry through the RSS 2.0 feed. You can leave a response, or trackback from your own site. You forgot Almond Day on Feb 16!!!! AND it is North Carolina Sweet Potato month– Not to mention it is: Cherry Month, Grapefruit month, Hot Breakfast Month AND Potato lovers month. I recall dump cake. It’s amazing what women cooked with and the recipes they concocted because of shortages, which I remember. There was no butter, and maybe some other oldtimers remember what they called margerine, a whitish mass encased in a vinyl packet with a orange button on top. You pushed on the button and food coloring was released into the bag. Then it was handed to the nearest kid whose job it was to knead, knead, knead, the thing until the color was consistent throughout. Michael would have that job. Hi Michael! The vinegar is a classic vegan baking trick…but also really handy when you are halfway into something and realize you’re out of eggs. I often use apple cider vinegar in cornbread instead of egg and it comes out great! The Wacky Cake is fabulous! And your nephew is very handsome. We make this in our family and it is called the “Lufkin Family Birthday Cake!” For a very long time my daughter was allergic to eggs as was my boyfriends son (along with dairy) so it was perfect! I am loving reading your blog every day! 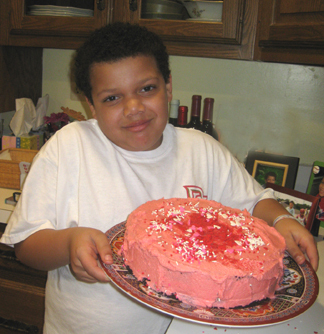 Mmmmm – that looks delicious – of course Michael’s artistry with the sprinkles makes all the difference!! Michael, that looks great! I’m glad you liked it, it was one of our family favorites when I was growing up. Nice decorating, too! And don’t forget Abraham Lincoln’s birthday (and my sister’s and my sister-in-law’s) on February 12! We’re not big cake fans (which always made birthday parties a challenge) but I sure do like the sprinkles! Good work, Michael. I love the cake! It’s so nice and colorful. When I look out the window from PA, at the moment, all I see is white. White on the ground, white in the trees and white from the sky. And I’ll bet that cake is really good! It’s also Mary Lyon’s birthday month (sorry I forget the actual day but it’s some day in February)! And even Mary Lyon herself would probably prefer the “wacky cake” over Deacon Porter’s Hat. For that matter, Deacon Porter would probably like some of the “wacky cake” as well! Please enjoy some cake for me! I need to do some work on my doctoral project and go shovel later when it stops snowing. Thanks, everyone, for the additions–and of course double thanks to Mattenylou for the recipe. We will eat a piece of cake in everyone’s honor! I’m sorry, Nina, that as a fellow Mount Holyoke alumna I forgot Mary Lyon’s birthday (February 28). It shall be observed on this blog either this year or next. Sheila, I never saw the margarine in those days, but I’ve heard about it. I’m glad we people didn’t worry about food dyes then. I forgot to say thank you to Meggin for the great egg/vinegar tip, about which I had never heard. Next time I’m making cornbread without an egg, I’ll try it and think of you. Stay warm, all of you who are in the snow……….. and please do enter the drawing if you haven’t yet (or even if you have)! My favorite “holiday” food would be apple pie at Thanksgiving. And I love the idea of “honey cake” from the http://www.Kosher.com web site.